Patrick Braxton-Andrew Missing in Mexico – Can You Help? Your News of Davidson team is publishing this information originally posted on the Davidson College Alumni Facebook page by Eileen Keeley, Vice President for College Relations. We shared the information on our NoD Facebook page last week, and we add it to our web site today in an effort to reach more people. 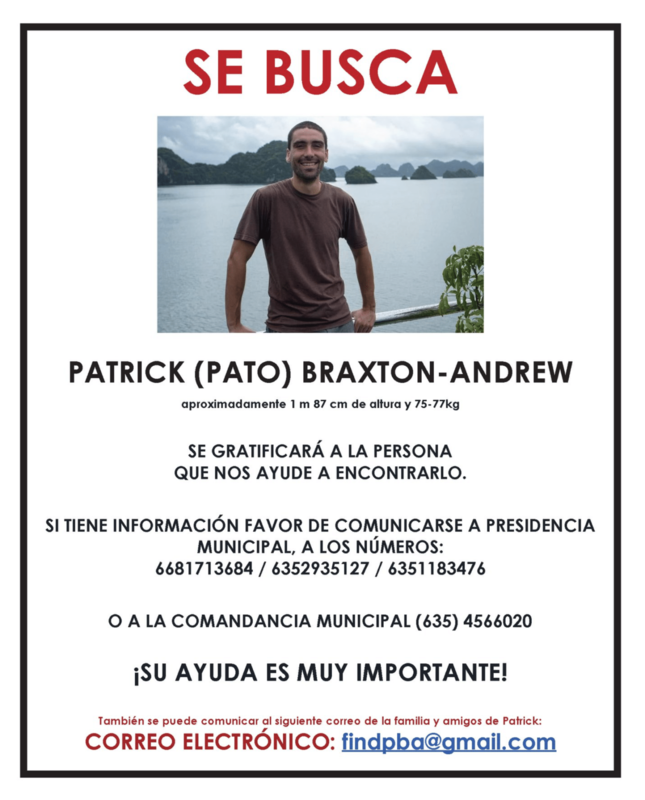 Davidson alumnus, Patrick Braxton-Andrew ’06, a teacher at the Woodlawn School, has gone missing near Urique, Mexico. He is the son of Davidson’s retired long-time cross country coach, and grew up in our community. The extended Davidson family is working to mobilize any resources we have to help them find him. Patrick is fluent in Spanish and has traveled abroad in Central America regularly. The following are the Initial details provided by his family. Patrick left North Carolina on Wednesday, October 24 and flew to Mexico, connecting to Chihuahua. On Thursday, Oct 25, early in the morning, he boarded the Copper Canyon train. He spent the night in Posada Barrancas Divisadero. We believe he took buses and arrived in Urique on Friday or Saturday, October 26 or 27. His family had text message contact with him on Saturday and Sunday afternoons. Their last text message with him was after 2:51 pm. He was supposed to meet his brother in Mexico City Tuesday, October 30, late afternoon, but he did not show up. The last time Patrick was seen was Sunday afternoon (10/28/2018) near the village of Urique, Mexico. He left his hotel for a walk and was last seen near a ranch that approximately 2.5km from the village. UPDATE: The family and the authorities are being overwhelmed by phone calls. Thank you for the support. To make this process more organized and helpful to the family, we are asking that you utilize the email and phone number located on the photo at the top of this article if you have any information. If you have any friends or contacts in the region, you are asked to share this flyer (below) with them.